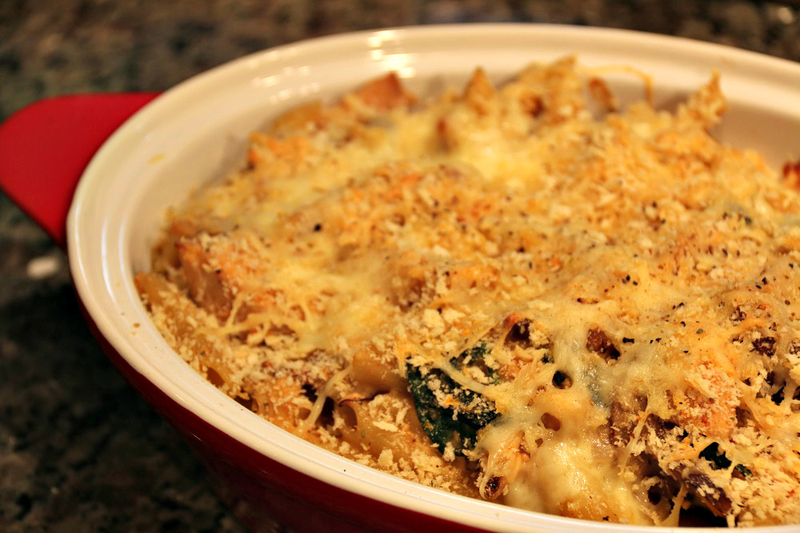 Ingredients: Olive Oil, Worcestershire Sauce, Panko breadcrumbs, Spinach, Stock, Penne Pasta, Shiitake & Cremini Mushrooms, Milk, Cream, Salt/ Pepper, Cooking Onion, Garlic, Asiago & Gruyere Cheeses and Club House La Grille Smouldering Smoked Applewood Seasoning. 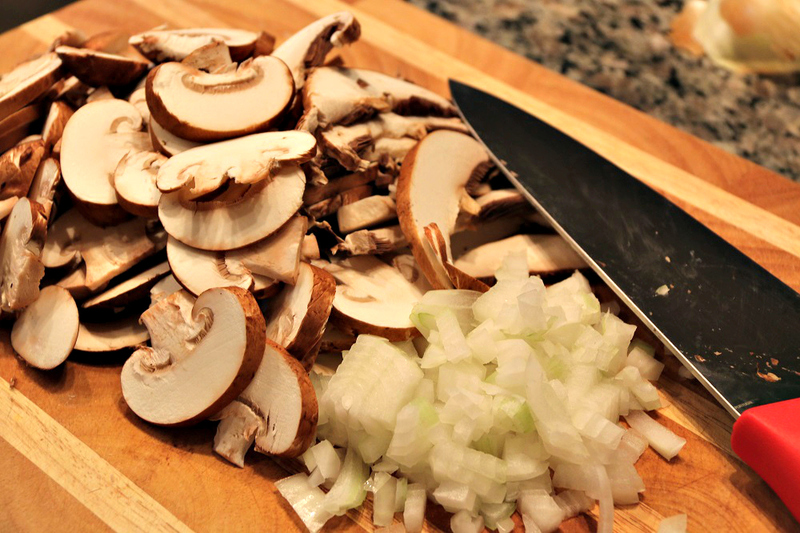 Slice mushrooms and chop onion, while pasta is cooking. Saute mushrooms, onions, and garlic. 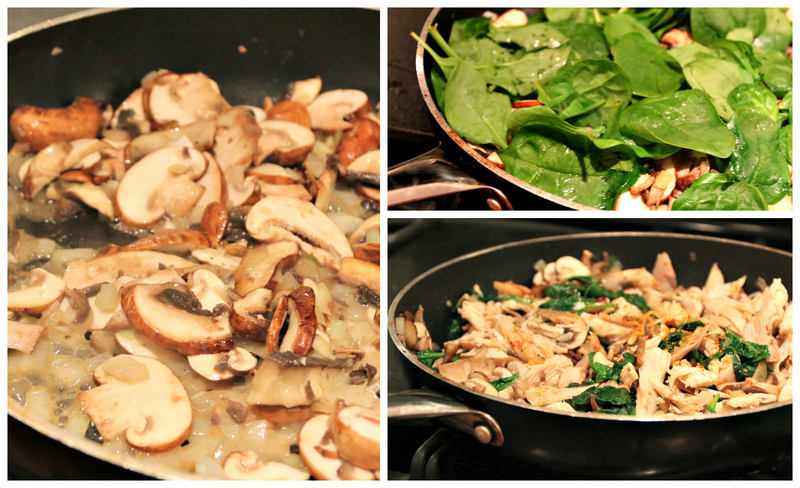 Then add your spinach, allow to wilt and then toss in your chicken, remove remove from heat. For making your roux, melt butter and add your flour while whisking and allow to cook out on low heat. Then slowly add your milk, cream and stock. Increase heat to medium, continue to whisk and add Worcestershire sauce, salt, pepper, and Club House La Grille Smouldering Smoked Applewood Seasoning. It’s important to continue whisking so you do not get flour clumps. When sauce has thickened fold in your vegetables/ chicken mix and return to heat. Then transfer pasta to an oven safe casserole dish, add topping mixture and pop in the oven for 20 minutes at 350 degrees. Cook pasta as per directions on the package. Drain and set aside for later use. While your pasta is cooking, pull apart your chicken and get ready to sauté the onions, mushrooms and garlic in the olive oil (make sure to not brown). 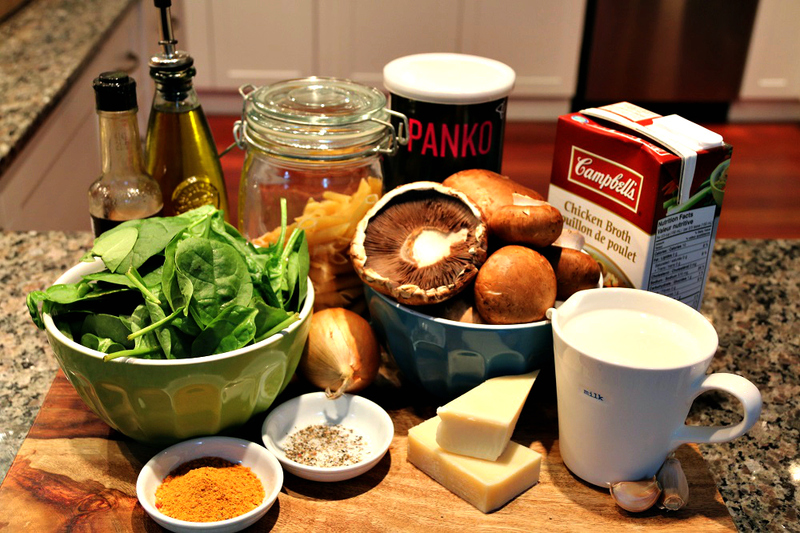 Once softened, add in your spinach and toss, this will allow spinach to wilt at an even pace. Add half of your Club House Smouldering Smoked Applewood Seasoning. To make the cream sauce, melt butter in a medium saucepan, add flour and start whisking ingredients over medium heat, cook your roux for about a minute or so, so your sauce will not taste like flour. 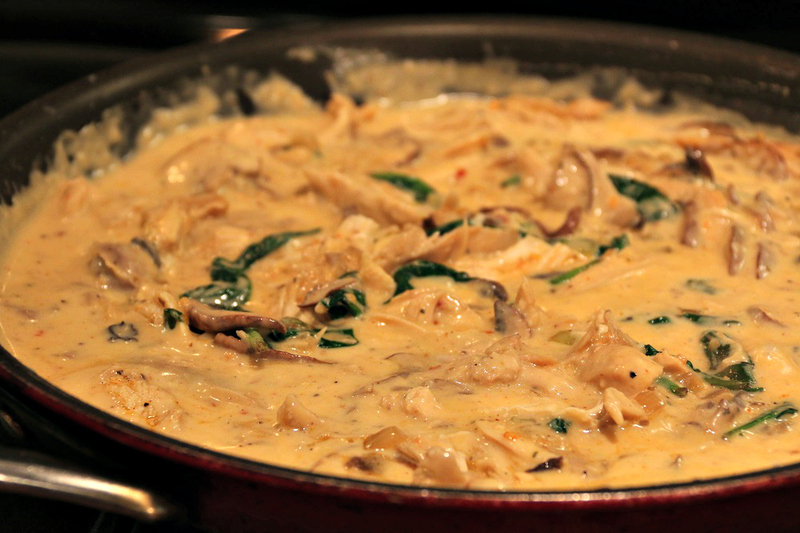 Then slowly add your milk, chicken stock and cream while whisking continuously. Once your sauce starts to thicken add your remaining Club House Smouldering Smoked Applewood Seasoning, cracked pepper and Worcestershire Sauce. 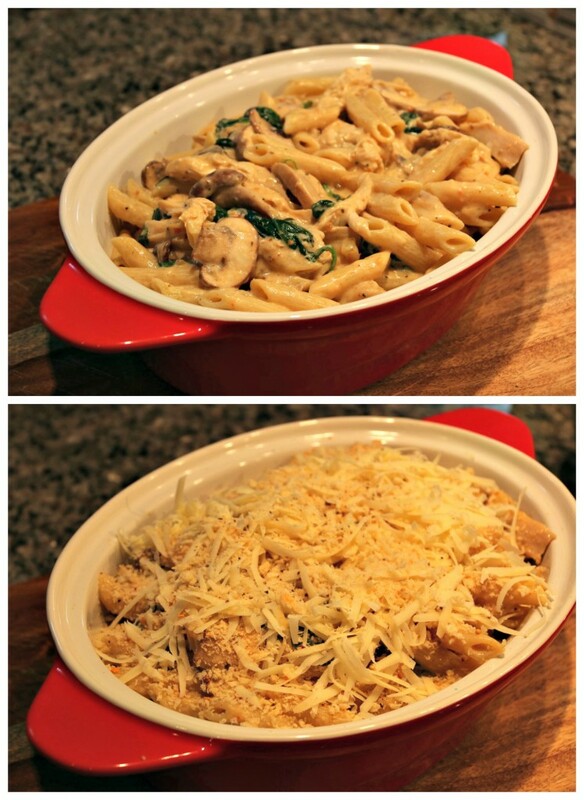 Fold in the sautéed veggies, chicken and cooked pasta, then transfer to a baking or casserole dish. 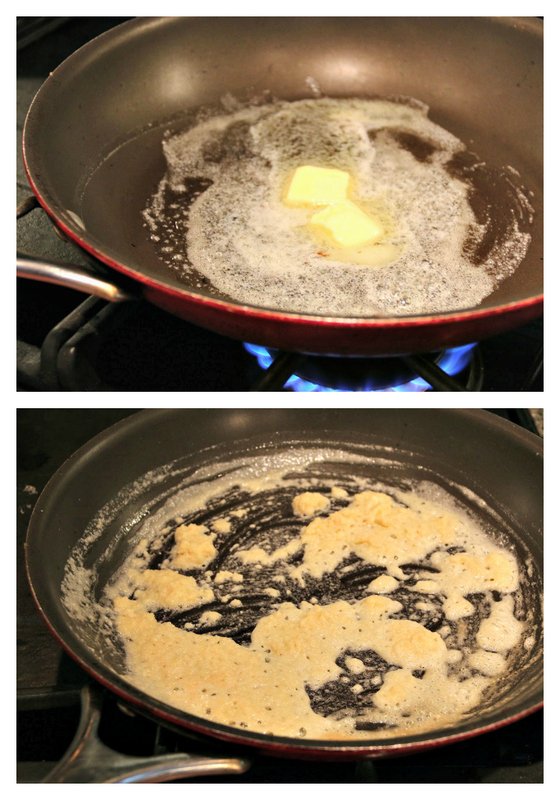 Mix together panko bread crumbs, seasoning and cracked pepper. After you transfer pasta to oven safe dish, sprinkle your grated cheeses then a layer of the panko bread crumb mix on top. Pop dish into your preheated oven 350 degrees for 20 minutes, or until your casserole is nice and bubbly. Chef’s Notes- When making your roux add liquids slowly to determine thickness of sauce. I make my sauce by eye and taste so I never really follow the recipe. If there is to much liquid just reduce sauce for longer. If sauce is not thickening you can always make a slurry. A slurry is using a thickening agent such as cornstarch, or arrowroot and water. Mix well, then add to sauce while stirring constantly. Sauce should thickening up fairly quickly after adding the slurry. 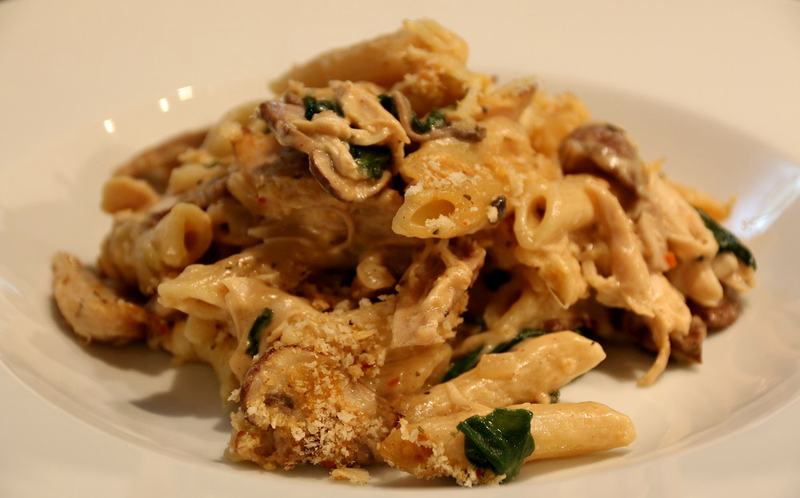 This entry was posted in Main Dishes, Pasta, Recipes and tagged casserole, chicken casserole, chicken penne pasta, penne pasta. What other cheese can I use besides Gruyere cheese? You could use any cheeses really, I just like the sharp taste of Gruyere with the smoke flavor. You could use a monetary jack cheese to give it a gooey, cheesy texture.